Skip to: How will creating a business website help your business grow? As a part of pre-preparation for getting started, you need to register a domain name (i.e – your website’s permanent address) and hosting space. I always recommend Bluehost, because, their pricing and services, both are perfect. Read: Why is Bluehost ideal for a small business website? So first, we’ll choose a domain name, and check if it’s available. If the domain name is already registered, you can think of a new one, or choose from one of the suggestions. Once, you own the domain name, you can get hosting. Select a hosting plan, and proceed to checkout. Bluehost has a WordPress optimized hosting service that provides optimized performance for websites built on WordPress. Checking out for a larger duration of time (like one year, or two) will be more beneficial than for shorter spans. However, you can choose the hosting service provider based on your location or previous experiences. There are so many hosting services out there and competition makes it vital for them to provide the best services. As decided earlier, we’ll go for WordPress for creating your business website. And now that we know WordPress is just perfect for your business website, it’s time to choose a theme. Represent your business online with an impressive website. Here are the WordPress templates designed to let you do so. We have templates that will suit any kind of business. These templates can be used for any profession, business, agency or company. On the other hand, you also have abundant Free WordPress themes that you can use to create a business website. Check out this collection of free WordPress themes for your website. You can even go for niche specific theme hunt. For instance – There are a number of WordPress themes designed for Lawyers. I recommend using such themes because those themes are professionally designed for a specific profession. There are themes for all your needs. For instance – pastry shop theme, themes for a restaurant website, lawyer WordPress themes, themes for a carpenter, architect, freelance web designer, physician, politician, music club, artist, salons, b&b, hotels, jewelry shop, pet shop – you name it! 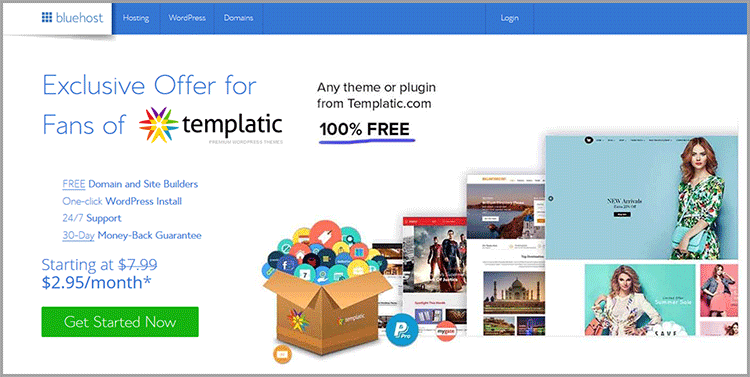 Check out the Best WordPress themes from Templatic. Finding the right theme for your business website isn’t going to be difficult. It can be confusing though! 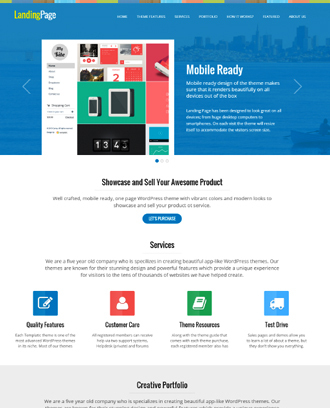 I’ve chosen iBusiness WordPress theme for this tutorial. It’s a general purpose WordPress business theme with quick edit options to make it easy for you to customize your website. 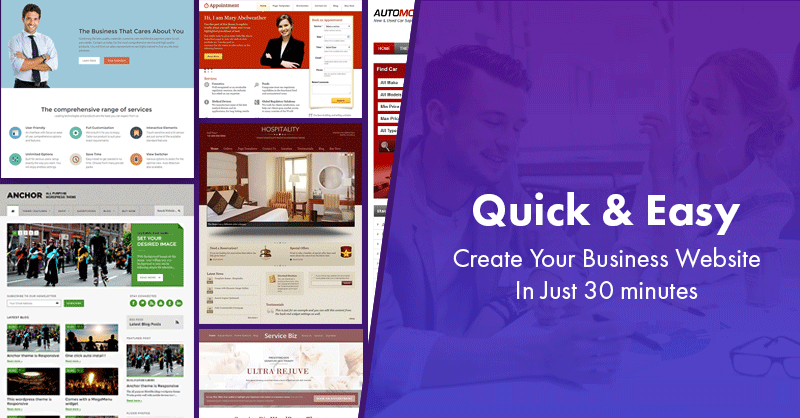 Get this Business Theme for absolutely FREE! 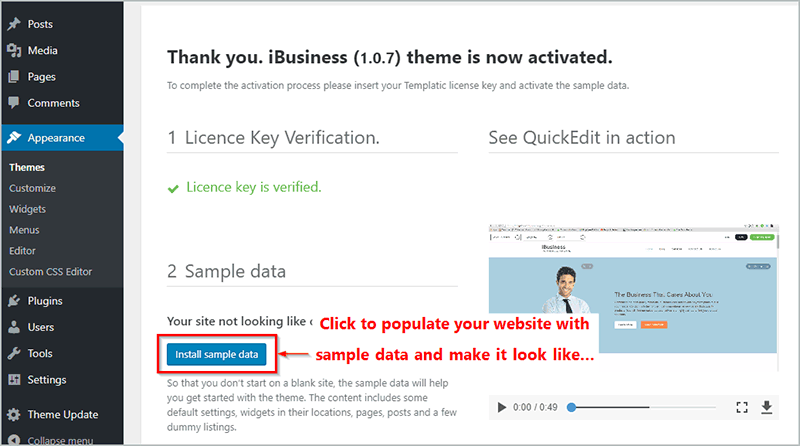 The iBusiness WordPress theme comes with one click – insert sample data button. So all you are supposed to do is click the button and wait for the theme to auto populate your website with example data. Installing sample data is not compulsory but I insist you do. Because with sample data installed, you’ll have your site a little bit organized as it will update your site and make it look exactly how you see it in the theme demo. Also, with the widgets arranged at their appropriate places, your site will start appearing more structured. Now, we’ll move on to the branding part of your business website? Have a logo already? iBusiness lets you update the logo instantly, with just one click. Also, you can instantly edit the tagline and replace it with your own. Here’s how it works. If you are using any other WordPress theme, these settings will probably be at Appearance >> Customize. So, if you have your logo already designed, you just have to upload the image file here. Using WordPress and a pre-designed theme doesn’t mean that you are stuck with the design. You can obviously make changes on how you want your website to look. With the backend options, you can do that. But that’s the beauty of a click and edit theme like iBusiness, you won’t even have to sign into your dashboard to make the change. The option for changing color is provided on the upper right corner of the theme. For your convenience, and for maintaining the symmetry of colors on your site, the color options are grouped. And here comes the most important step of all. When you decide to create your own website, don’t you have an imaginary site at the back of your mind? Now is the time to focus on how you want your site to be. Which section is where, what are the elements that you want on your homepage, on the sidebars, and in the footer. Well, this can be very easily done by using the widgets. Rearranging the widgets will help you restructure your website very easily. Don’t want the recent comments section on the homepage, remove that widget. Want to show a calendar in the sidebar, just pick up the widget and place it in required the widget area. Now with the designing and customization parts are done, it’s time to get rid of the example data that your theme provides and update your site with useful and fresh content/pages. It is very important to arrange the pages and design the navigation of your website thoughtfully. With a smooth navigation and links arranged systematically on your site, your visitors will be able to smoothly traverse through them. So first, we should talk about the most common and important pages for your business website. Let’s have a look at the list of required pages for your business website. For navigation, you can create intuitive menus, with links to all the important pages on your website. However, what you want to show on the menu of your website, is totally your call. But make sure that it includes the links to the pages that matter most for your website. You can even decide the hierarchy of the menu items based on that. 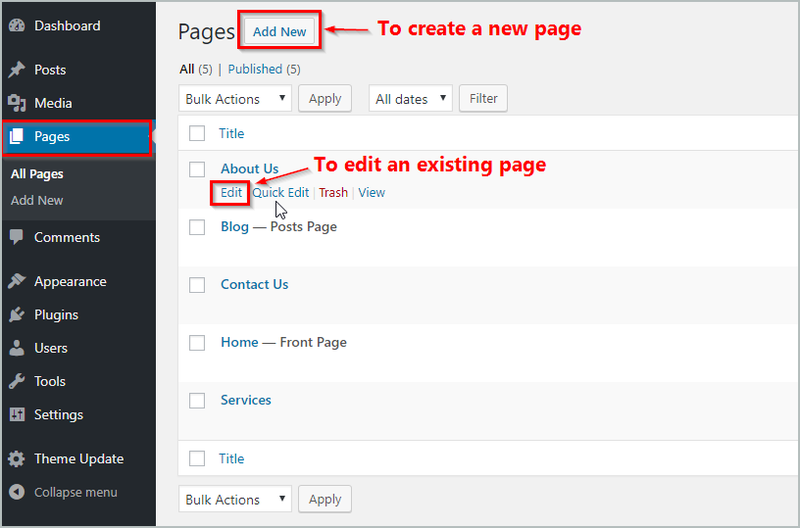 Here’s a guide on how you can setup menus on your WordPress website. An ideal homepage is a combination of a great design and great content. The homepage should basically contain all the important information about your business. 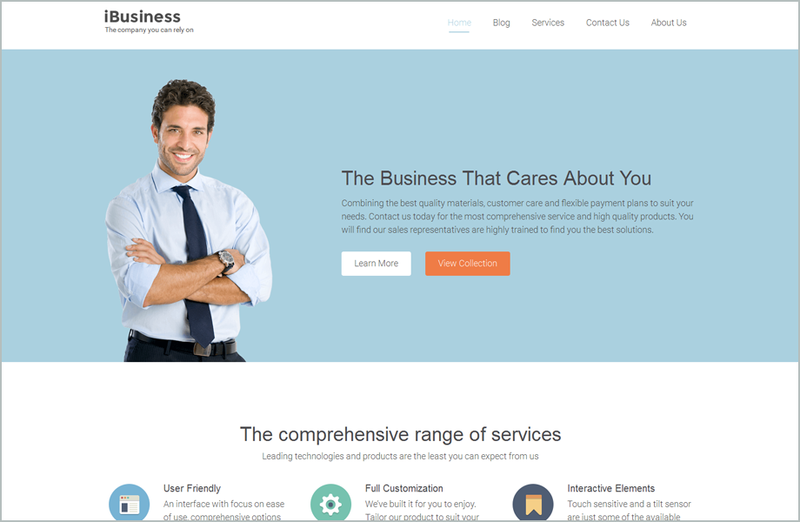 When you use a premium theme like iBusiness, you get a thoughtfully designed homepage. However, with the editing options, you are free to customize it as much as you like. You have to be very careful when you design your homepage. It is the page most of your visitors will start on. The homepage should ideally reflect the essence of your business as well as the content of your website. This can be a single page or a group of pages that declare “what you do”. Service pages can be the pages that either contains an explanation of the type of services, pricing for the services, and the accomplished work. Using the service page you can also display some of your accomplished work. You can display each service with a different page or simply all the services on the same page depending on how much you have to tell. About us page works on the fact that the more your customers know you, the more they trust you. It’s always a good practice to tell your clients about yourself. Or anything in general about you. You can make this page as interesting as you want! The contact form is a very important module on your business website. If the theme you choose does not come with a working contact form, you don’t have to worry. There are a lot of contact form plugins that you can integrate into your website for contact forms on your business website. iBusiness is compatible with Free Contact Form 7 plugin that lets you create amazing contact forms very easily. With a contact form, you are making it easier for your interested visitors to contact you and get help with their confusions. 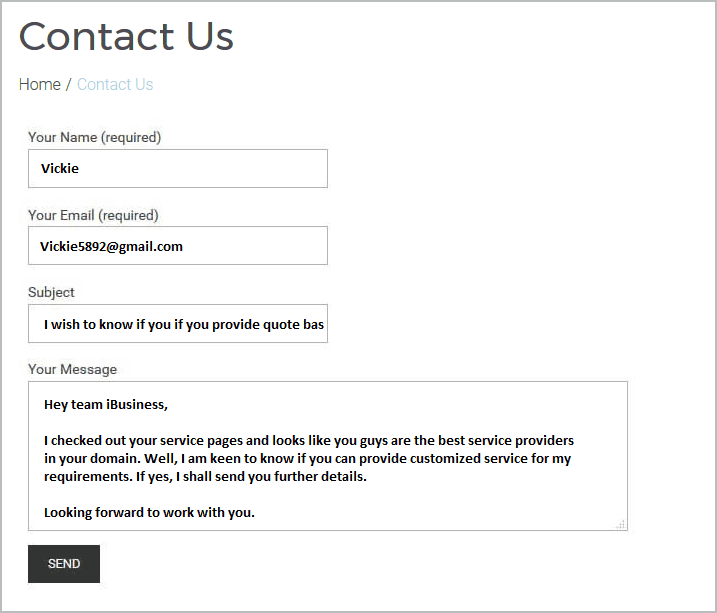 iBusiness is compatible with the free Contact form 7 plugin. Just integrate it into your website and create a form with the fields you want. Make sure that the form you create is simple. Even though this section is not so compulsory for a business website, it can work wonders if used properly. But what can you blog on your business website? You can even use this section to keep your users informed. You can let your users know that you’ve changed your business policies, or you can use this section to tell your clients that you are providing a 30% discount for any appointment booked on the new year eve. With the above steps completed successfully, you now have a fully functional and information-rich business website ready. Now is the time to spread a word about it. To promote your website and let your existing clients/customers know about you, simply put your website’s address on your visiting card. Based on your business domain and the functional area of your business, you can choose where you would want to advertise for it. For instance – If you are running a restaurant, you can advertise on the local tv channels and make people aware that they can book their tables at your place through your website. If you are an investment consultant, you can have your advertisement printed on the regional newspaper and inspire people to check out your website to know more about your services. For an internet company of web developers of graphic designers, you can promote yourself through the internet itself. Asking your co-ordinate businesses to lend advertisement spaces on their sites. Have yourself a page created on Facebook, and see how fast it can reach more and more people! In 2019, when social media has already taken over, social media marketing is one of the best ways to address people at large. However, you can also look for some social media marketing agencies that can help you promote your website through social media. You can even subscribe to an SEO & Digital marketing agency to make sure that your website is gaining deserved traction. Advertisement sections on your website can help you earn. You can show advertisements of your affiliate businesses and thereby earn through them. At the same time, you can even approach related business to advertise your business. For instance – A local fish aquarium store can display the advertisements of the fish food companies. A spa salon website can display the advertisement of cosmetic brands. Creating your business website is not a one-time task. A business website needs minor updating from time to time. Not that it’s compulsory to do so, but keeping your website updated is always a good practice. You can even add new blogs, delete unwanted pages, update existing pages, as and when required. and there can be so many things that you can do to keep your website fresh and updated from time to time. Including software updates, updating the news and blog section, etc. You can either run the maintenance routines yourself or hire someone to maintain your WordPress website for you. How will a business website help your business grow? If you are confused about whether you should go for a business website or not, here are a few of the many reasons why creating a business website is a great idea. With your business website, you are basically opening up doors for new opportunities. You are making a way for the prospective customers to know you, get in touch with you. A website can help you express your services, business to the people at large. It gives you the opportunity to be found and recognized. The contact form on your website is the easiest way for your visitors to get in touch with you. Besides, you can directly provide your contact details like email address, phone number, your office/workplace’s address on your website. Therefore, any visitor curious to know more about your services can reach you instantly. It’s always good to have emails from your prospective clients interested in making a deal with you. Modern business websites incline towards using different tools to improve the website’s interaction with the customers. And a live chat feature can help you with that. To make your business website more interactive, you can use a live chat integration. Your clients can directly send a message to you without having to fill up the contact form. It’s a quicker, easier and effective method to make your site more interactive. Here’s a list of top 10 Live Chat software compared. Is there a better way than a website to describe your services? Clearly Not. On a business website, you can create innumerable services pages to let your visitors know everything about the kind of service you provide. The best way to do so is by adding media like images and videos to show your work. Advertisements(on various channels like television, the internet, social media, etc) are short. They can’t precisely explain what you want to. But the pages on your website can! Through your business website, you can offer services like appointment booking for your clients. Or, you can just sell your products. The possibilities are endless. If you want to create a website where you offer online appointment booking, it’s really easy. You just have to pick up a WordPress theme with appointment booking feature. Such WordPress appointment booking themes are pre-programmed, pre-designed and come with a ready to use appointment booking system. Here’s a collection of appointment booking WordPress themes to create your business website that allows online booking. If you start ranking for the generic keywords related to your business, then you’re sure to get a surge of clients through your website. For example: Suppose, you are a therapist based in South Carolina, and your website starts showing up as the top results for “Therapists in South Carolina”, then you can expect a lot of good things coming your way. However, for this, you may need to hire an SEO expert or learn and try to optimize your site on your own. Lastly, if any of the reasons listed above don’t please you enough, you should still create your business website as one of the efforts to upgrade your business. Taking chances is what business all about. So why not try exploring this option? So as you see, there are just 5 simple steps to be followed to create your business website with WordPress. To make your business website more interesting you can use one of these business WordPress themes and various free WordPress plugins. Creating a website with WordPress is fun once you know the basic. And knowing the basics of WordPress is really easy. Also, it provides all the easy options to maintain and manage your website.